Defining RSUs and explaining their place in executive compensation. 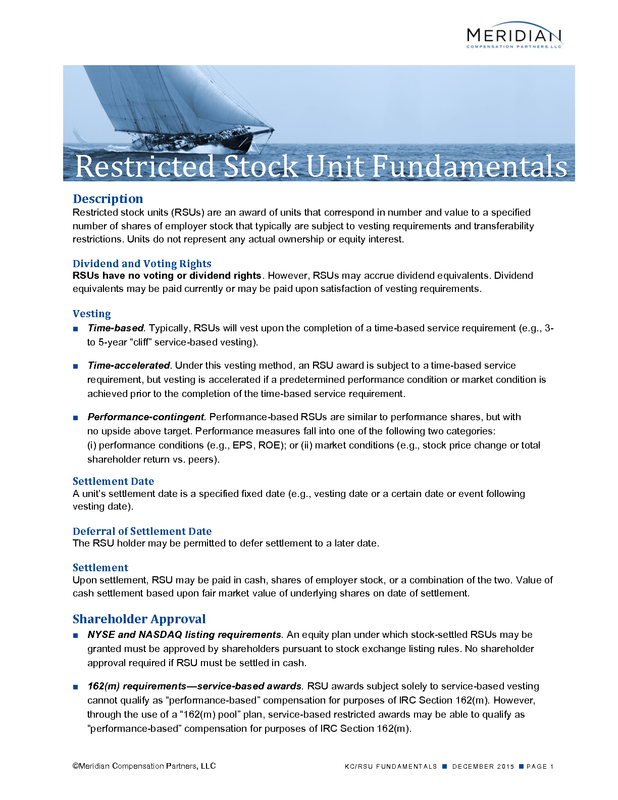 Restricted stock units (RSUs) are an award of units that correspond in number and value to a specified number of shares of employer stock that typically are subject to vesting requirements and transferability restrictions. Units do not represent any actual ownership or equity interest. RSUs have no voting or dividend rights. However, RSUs may accrue dividend equivalents. Dividend equivalents may be paid currently or may be paid upon satisfaction of vesting requirements. Time-based. Typically, RSUs will vest upon the completion of a time-based service requirement (e.g., 3- to 5-year “cliff” service-based vesting). Time-accelerated. Under this vesting method, an RSU award is subject to a time-based service requirement, but vesting is accelerated if a predetermined performance condition or market condition is achieved prior to the completion of the time-based service requirement. Performance-contingent. Performance-based RSUs are similar to performance shares, but with no upside above target. Performance measures fall into one of the following two categories: (i) performance conditions (e.g., EPS, ROE); or (ii) market conditions (e.g., stock price change or total shareholder return vs. peers). A unit’s settlement date is a specified fixed date (e.g., vesting date or a certain date or event following vesting date). The RSU holder may be permitted to defer settlement to a later date. Upon settlement, RSU may be paid in cash, shares of employer stock, or a combination of the two. Value of cash settlement based upon fair market value of underlying shares on date of settlement. NYSE and NASDAQ listing requirements. An equity plan under which stock-settled RSUs may be granted must be approved by shareholders pursuant to stock exchange listing rules. No shareholder approval required if RSU must be settled in cash. 162(m) requirements—service-based awards. RSU awards subject solely to service-based vesting cannot qualify as “performance-based” compensation for purposes of IRC Section 162(m). However, through the use of a “162(m) pool” plan, service-based restricted awards may be able to qualify as “performance-based” compensation for purposes of IRC Section 162(m). 162(m) requirements—performance-based awards. Shareholder approval of the material terms of RSU awards subject to performance-based vesting is required for awards to qualify as “performance-based” compensation for purposes of IRC Section 162(m). Note: Additional requirements must be satisfied for performance units to qualify as “performance-based” compensation. The following tax consequences assume that RSUs are exempt from IRC Section 409A (see discussion below). At grant. No tax consequences (Section 83(b) elections are not available for RSUs). At vesting. No tax consequences (unless payment of RSUs coincides with end of vesting period). When paid, taxed as ordinary income. Treatment of dividends. Any dividend equivalents received during the period of restriction (or accrued and paid upon vesting) are taxed as ordinary income, not dividend income. The following tax consequences assume that RSUs are exempt from or compliant with IRC Section 409A (see discussion below). Deduction timing and amount. Employer may take a tax deduction in the amount and at the time the employee realizes ordinary income upon settlement of the RSUs. Tax deduction may be taken for fiscal year in which settlement of RSUs is accrued, provided payment is made within 2½ months after the end of such fiscal year. 162(m) implications. IRC Section 162(m) denies deduction for compensation in excess of $1 million paid to the CEO and other three top paid executive officers (excluding CFO), unless “performance-based” (see discussion above regarding shareholder approval). Requirements to be exempt from IRC Section 409A. Generally, RSUs will be exempt from IRC Section 409A if the “short-term deferral rule” is satisfied. The short-term deferral rule is satisfied if RSUs are paid within 2½ months after the later of: (i) the end of the employee’s tax year (always the calendar year) during which the RSUs vested; or (ii) the end of the employer’s tax year during which the RSUs vested. The short-term deferral rule is always satisfied if RSUs are paid upon vesting. Failure to meet exemption requirements. If an RSU grant is not exempt from IRC Section 409A or if settlement of RSU is deferred, then the grant would be subject to 409A substantive requirements. To comply with these requirements, certain plan design features may need to be modified. Failure to comply with these requirements would subject a grant recipient to adverse tax consequences. RSU’s grant date “fair value” is amortized over the grant’s requisite service period (e.g., typically the vesting period). “Fair value” is equal to the number of RSUs granted multiplied by the grant date fair market value of a share of company stock. Dividend equivalents paid on RSUs should be charged against retained earnings. If dividend equivalents are not paid or accrued on RSUs, then the grant date “fair value” of the RSUs is reduced by the present value of the dividends expected to be declared on outstanding shares. Each reporting period, the number of RSUs that are expected to be earned is re-determined and the “fair value” of these RSUs is amortized over the remaining requisite period less amounts previously recognized. “Fair value” is equal to the number of RSUs that are expected to be earned (or actually earned) multiplied by the grant date fair market value of a share of company stock. At the end of the requisite service period, compensation cost is trued-up to equal the “fair value” of the RSUs that actually vest. Previously recognized compensation cost for RSUs that did not vest would be reversed. The RSUs’ grant date “fair value” is amortized over the requisite service period. At the end of each reporting period, RSUs’ “fair value” is re-measured (e.g., marked-to-“fair value”) and amortized over the remaining requisite service period less amounts previously recognized. “Fair value” is equal to the number of RSUs that are expected to be earned (or actually earned) multiplied by the fair market value of a share of company stock on the date of determination. At the end of each reporting period after the requisite service period is completed, the RSUs’ “fair value” would continue to be re-measured (i.e., marked-to-“fair value”) until settlement and any increase/decrease in the “fair value” would be immediately recognized as a compensation cost or income. Upon settlement of RSU, compensation cost is trued-up to equal the RSUs’ intrinsic value (i.e., fair market value of the underlying shares on the date of settlement). At the end of each reporting period, the number of RSUs expected to vest is re-determined and the “fair value” of these units would be re-measured (i.e., marked-to-“fair value”) and amortized over the remaining requisite service period less amounts previously recognized. At time of settlement, compensation cost is trued-up to equal the amount of cash actually paid. Previously recognized compensation expense for RSUs that did not vest would be reversed. At the end of each reporting period, the RSUs’ “fair value” is re-measured (i.e., marked-to-“fair value”) and amortized over the remaining requisite service period less amounts previously recognized. “Fair value” may be determined using a Monte Carlo simulation. Note: The “fair value” of the RSU award may be greater or less than the fair market value of the underlying stock on the date of determination. Nonvested RSUs are not included in the computation of the denominator of basic EPS. Vested RSUs that can only be paid in shares of stock are considered outstanding and are included in the computation of the denominator of basic EPS. Nonvested RSUs with a performance or market condition are included in the computation of the denominator of dilutive EPS if the RSUs are dilutive (e.g., paid in company stock) and if their conditions (a) have been satisfied at the reporting date, or (b) would have been satisfied if the reporting date was the end of the performance period.